Thyme (Thymus vulgaris, Linn.) is a very diminutive perennial herb, of the natural order Labiatae, native of dry, stony places on Mediterranean coasts, but found occasionally naturalized as an escape from gardens in civilized countries, both warm and cold. From early days it has been popularly grown for culinary purposes. The name is from the Greek word thyo, or sacrifice, because of its use as incense to perfume the temples. With the Romans it was very popular both in cookery and as a bee forage. Like its relatives sage and marjoram, it has practically disappeared from medicine, though formerly it was very popular because of its reputed properties. The proctimbent, branched, slender, woody stems, which seldom reach 12 inches, bear oblong, triangular, tapering leaves from 1/4 to 1/2 inch long, green above and gray beneath. In the axils of the upper leaves are little pink or lilac flowers, which form whorls and loose, leafy spikes. The seeds, of which there are 170,000 to the ounce, and 24 ounces to the quart, retain their germinating power for three years. Thyme does best in a rather dry, moderately fertile, light soil well exposed to the sun. Cuttings, layers and divisions may be made, but the popular way to propagate is by seed. Because the seed is very small, it should be sown very shallow or only pressed upon the surface and then sprinkled with finely sifted soil. A small seedbed should be used in preference to sowing in the open ground first, because better attention can be given such little beds; second, because the area where the plants are ultimately to be can be used for an early-maturing crop. In the seedbed made out of doors in early spring, the drills may be made 4 to 6 inches apart and the seeds sown at the rate of 5 or 6 to the inch. A pound should produce enough plants for an acre. In hand sowing direct in the field, a fine dry sand is often thoroughly mixed with the seed to prevent too close planting. The proportion chosen is sometimes as great as four times as much sand as seed. Whether sown direct in the field or transplanted the plants should finally not stand closer than 8 inches - 10 is preferred. When first set they may be half this distance. In a small way one plant to the square foot is a good rate to follow. The young plants may be set in the field during June, or even as late as July, preferably just before or just after a shower. The alternate plants may be removed in late August or early September, the alternate rows about three weeks later and the final crop in October. Thyme will winter well. In home garden practice it may be treated like sage. In the coldest climates it may be mulched with leaves or litter to prevent undue thawing and freezing and consequent heaving of the soil. In the spring the plants should be dug, divided and reset in a new situation. When seed is desired, the ripening tops must be cut frequently, because the plants mature very unevenly. But this method is often more wasteful than spreading cloths or sheets of paper beneath the plants and allowing the seed to drop in them as it ripens. Twice a day, preferably about noon, and in the late afternoon the plants should be gently jarred to make the ripe seeds fall into the sheets. What falls should then be collected and spread in a warm, airy room to dry thoroughly. When this method is practiced the stems are cut finally; that is, when the bulk of the seed has been gathered. They are dried, threshed or rubbed and the trash removed, by sifting. During damp weather the seed will not separate readily from the plants. Of the common thyme there are two varieties: narrow-leaved and broad-leaved. The former, which has small grayish-green leaves, is more aromatic and pleasing thiin the latter, which, however, is much more popular, mainly because of its size, and not because of its superiority to the narrow-leaved kind. It is also known as winter or German thyme. The plant is taller and larger and has bigger leaves, flowers and seeds than the narrow-leaved variety and is decidedly more bitter. The green parts, either fresh, dried or in decoction, are used very extensively for flavoring soups, gravies, stews, sauces, forcemeats, sausages, dressings, etc. For drying, the tender stems are gathered after the dew is off and exposed to warm air in the shade. When crisp they are rubbed, the trash removed and the powder placed in stoppered bottles or tins. All parts of the plant are fragrant because of the volatile oil, which is commercially distilled mainly in Fiance. About one per cent of the green parts is oil, which after distillation is at first a reddish-brown fluid. It loses its color on redistillation and becomes slightly less fragrant. Both grades of oil are used commercially in perfumery. In the oil are also crystals (thymol), which resemble camphor and because of their pleasant odor are used as a disinfectant where the strong-smelling carbolic acid would be objectionable. 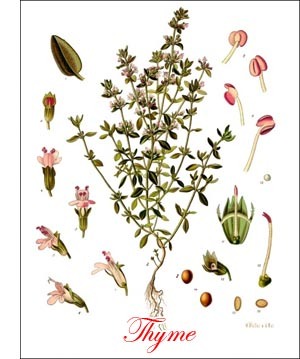 Besides common thyme two other related species are cultivated to some extent for culinary purposes. Lemon thyme (T. citriodorus, Pers. ), like its common relative, is a little undershrub, with procumbent stems and with a particularly pleasing fragrance. Wild thyme, or mother-of-thyme (T. serpyllum, Linn. ), is a less grown perennial, with violet or pink flowers. It is occasionally seen in country home gardens, and is also used somewhat for seasoning.